What could be sweeter than adding a flock of kids to your wedding? Either making the trek down the aisle or weaving in and out of festivities, kids add a bright and energetic tone to any wedding. 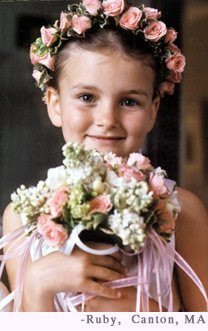 In Europe, kids make up the wedding party almost entirely. Remember Lady Diana's wedding to Prince Charles in 1981? Her eldest attendant was a junior bridesmaid. 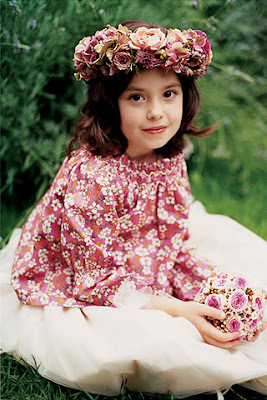 The rest were taffeta-clad flower girls and pages dressed in the traditional costume of the English Court. 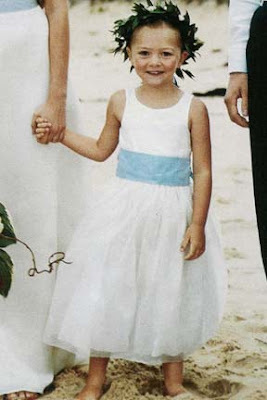 Whatever theme or direction your wedding takes, children's fashion usually echoes that of the wedding party. 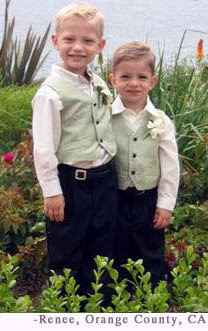 If you're in a ball gown and your groom in a tux, the ring bearer can wear a diminutive version of the groom's tux. 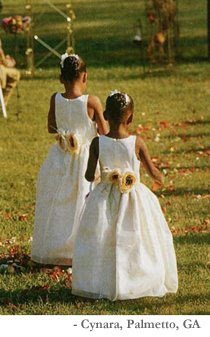 The flower girls could wear fluffy white dresses with a contrasting sash, possibly combining some of the laces from the bride's gown. There are a lot of ways to dress kids so your wedding will be all the more special. You may be wearing a ball gown and like the storybook theme. Go all out. 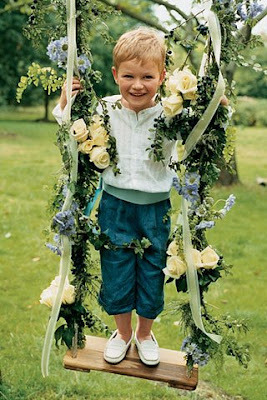 Dress your boy attendants in page costumes and girls in tulle dresses with floral wreaths on their heads. Present them the gift of ballet slippers to wear. They'll cherish these long after the wedding. Other ideas around the storybook could be a Scottish Wedding with all the groomsmen in kilts. Ditto the little groomsmen. Boy attendants can get their tuxes fitted right alongside the groomsmen. Most formal wear shops have boy's sizes available to rent or buy. Formal page outfits can be found by perusing bridal magazines and online. Magazines are good resources for familiarizing you with trends and where to look for what. Retailers are listed in back. Also, you can go online and order direct from manufacturers. Specialty kid's shops can order or have suits made. If you have an idea of what you want but can't find it in the right color or fabric, consider going custom and having a suit made or making it yourself. If this is beyond your expertise or you don't have time, find the right tailor or dressmaker. He or she can help put together patterns and fabrics. 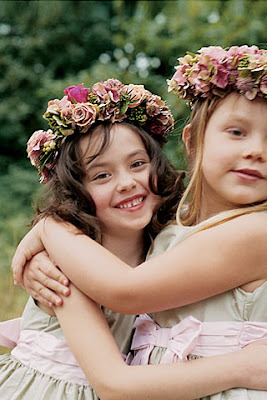 Flower Girl's dresses are easier to find. 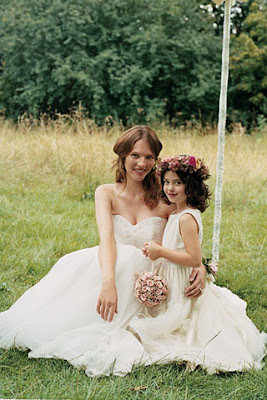 As mentioned above, bridal magazines and online sites have special sections devoted to your little attendants. Still, if you can't find the dresses you want, go custom. 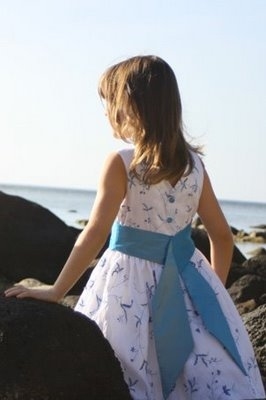 In Europe, Little Eglantine has a collection of kidswear that can be customized. 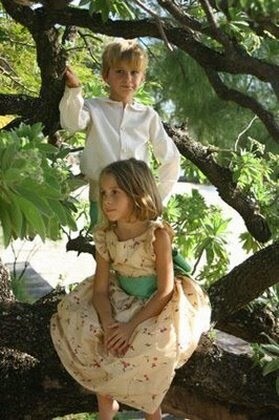 If you're in the USA Kaya Couture in the LA area is one of the only custom designers of kid's formal wear. 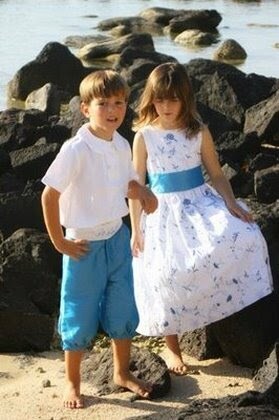 Kaya also has an extensive line of ready to wear flower girl dresses that can be ordered. Once you go the custom route there are some things you need to know about fabrics, particularly fabrics flattering on children. If you use silks, use medium-weight ones like dupioni or shantung. These will work for winter weddings too, provided you pick a style with long sleeves, jackets, etc. Heavier satins and brocades are out—too weighty for a child to carry off and be comfortable in all day. Instead try lightweight velvets in deep jewel tones for those Christmas/Winter weddings. For spring/ summer dresses, lightweight fabrics like organza, chiffon, and tulle can overlay medium weight silks like those mentioned above. Linen is great for casual and beach weddings.